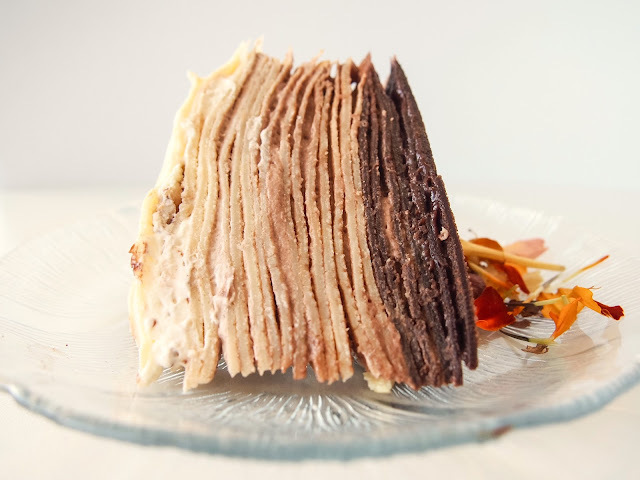 If you ask the Internet, the crepe cake was invented by a high-end bakery, Lady M Cake Boutique, on Manhattan's upper east side. 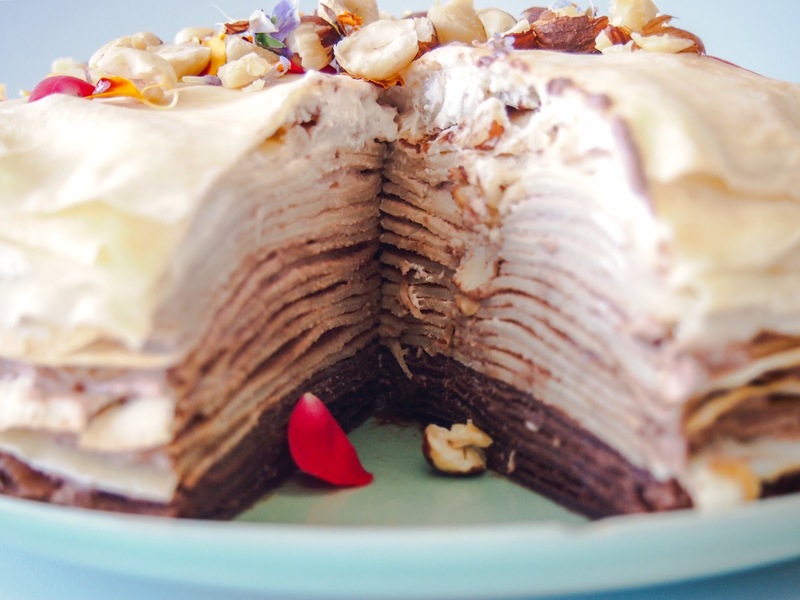 I have my doubts about this origin story because I can't believe that no one thought of stacking crepes and filling them with something delicious prior to 2002, but they've trademarked it, so it must be true...? Mille crêpe is a French cake, made with with one million crepes. Or maybe one thousand. French isn't my strong point. 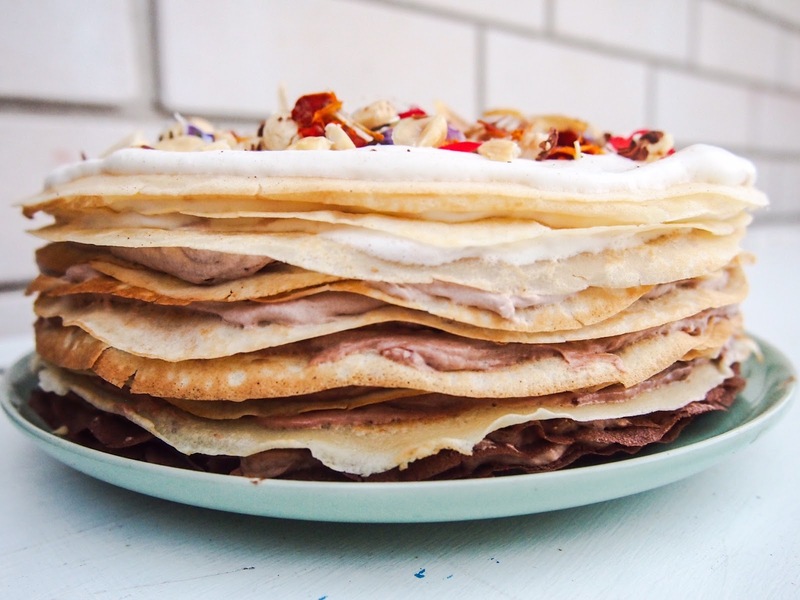 Hundreds of crepes layered with pastry creme, or whipped cream, ganache, anything. There are as many options as there are crepes in the stack. There is a Swedish version too, pannkakstårta, but I'm sure they stole the idea from Manhattan. Or the French. Anyway, those Swedes love turning things into cake. Their version is more low key; filled simply with cream and lingonberry jam. There is also Swedish sandwich cake, Smörgåstårta, which I never tried because a) it is a special occasion cake, and b) I don't believe that fish roe, boiled egg, prawns and sliced ham is a good combo. But that's just me, and I'm sure 9 million swedes would disagree. I have dreamed of this cake, but I've always worked in small offices and my apartment is small and cramped, full of stuff and dominated by two rabbits, so I don't invite people over. BUT, my colleague's birthday this year falls just one day after Pancake Tuesday, and there are at least 6 of us on a quiet day, so finally, an excuse to make it! 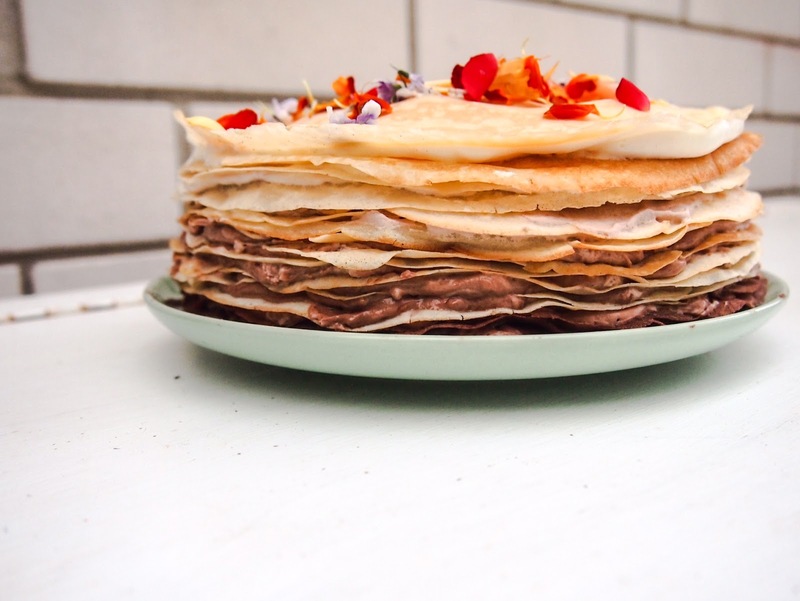 It's actually quite simple, but it's time consuming because you have to cook 100 crepes. Or maybe 20....I lost count. Turns out I am quite bad at making crepes, and am deficient in the necessary flipping skills, so I adopted a trick I'd read online and used two pans. Rather than attempting to flip, you just up-end one pan over the other. The added benefit of this technique is that you can set up a mini production line and cook two at a time. 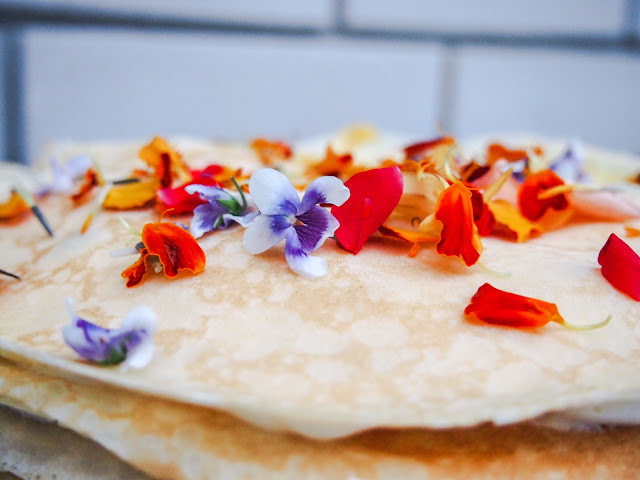 You can make the crepe batter and the filling in advance. In fact, crepe batter is better when it's had a chance to rest, and the filling is easier to work with when it's cold. I used this recipe for the crepes (and just made up the proportions for the chocolate ones at the bottom). Had I not ruined, and then eaten, about 6 of them one batch would have been enough, but I ended up making one full batch of plain, and then a half batch of chocolate ones. I'd read that filling is easier if you use an offset spatula, which I don't own, so I'm happy to report that the back of a spoon works just fine. The goal is to spread the filling right to the edge, making the layer thinner in the centre (which helps to avoid making too much of a sloped dome). I had to check my level a few times, and I started to get a bit lopsided, but with some calculated filling on the next layer or two you can correct the angle. 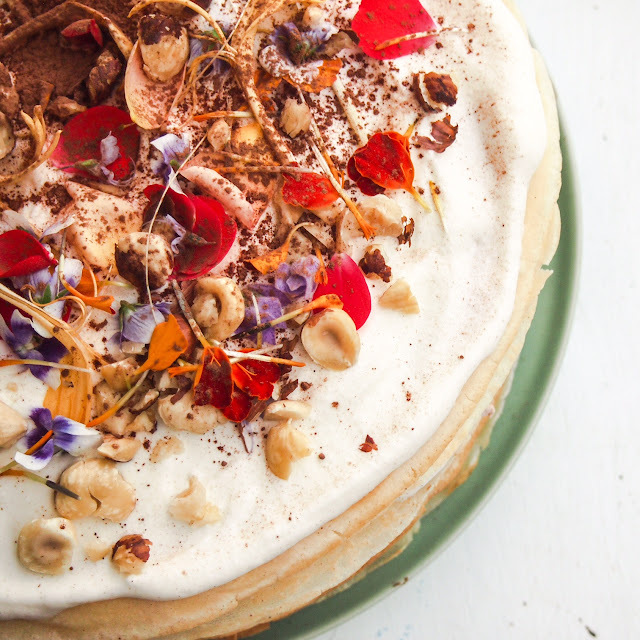 I had wanted to make a citrus filling, maybe some lemon curd and a little whipped cream, but I was over-ruled and instructed to use chocolate and hazelnuts. I'm not a huge fan of chocolate cakes, but I do adore Nutella. I was going for ombre, so the bottom couple of layers are pure Nutella. For the other layers I whipped 500ml of cream, adding some icing sugar, vanilla and a splash of Frangelico. I divided the whipped cream roughly into three. One third became a hazelnut creme, with a few large spoonfuls of Nutella folded through; another third got a heaped spoon of cocoa to make a plainer chocolate flavour; and the remaining third was just cream. Delicious, wonderful cream. Starting with the hazelnut creme I worked my way up, making the layers lighter and lighter. All told it takes about an hour to assemble. I'll be honest with you: by the time I was done I didn't care what the cake was going to taste like because it was so damn pretty.